Williams River was—you have to wonder how a trout could survive such power. 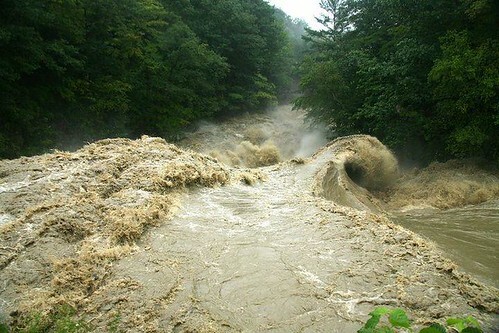 My home state of Vermont was recently ravaged by flooding from the rains of Tropical Storm Irene. Tiny creeks became rushing torrents, midsize rivers hit record levels, and the state’s largest rivers flowed over parts of their floodplains that rarely see water. The devastating impacts of this flooding on the residents of the Green Mountain State have been widely broadcast, and recovery will take a great deal of time. I wondered about the impacts of this flooding on the local fisheries, so I began to research what happens to fish during floods. Fish are incredibly adaptable animals. Stream-dwelling trout, for example, live in an environment that has a tendency to change a fair amount. Spring flooding is part of the normal cycle for these and other animals, and they have learned to make it through this annual event for millennia. A flash-flood event is somewhat similar, albeit far more abrupt.